What palm reading can reveal about your most dominant personality traits. Few people are really aware of the vast amount of information you can gain from studying someone’s hands. But in palmistry, the art of palm reading, everything — from the shape of your hands to the size of your fingers — can tell an interesting story about who you are, including your "archetype" (aka personality type). According to palm reading, your archetype is the essence of who you are. It reveals your personality type, your strengths and weakness, you most dominant personality traits — everything that defines you and affects how you see the world and experience it. There are 22 different personality archetypes in total — each one associated with the 22 major arcana cards of a Tarot deck — and you can tell which archetype you are using a simple palmistry guide. However, of these different personality types, the "High Priestess" archetype is one of the rarest of them all. If you have the markings of the “High Priestess,” you have a rare and unique view of the world that should be celebrated for the wonder that it is. So how can you tell if you have the world's rarest personality type, according to palm reading? All archetypes begin with studying your hands to determine their “pairing”, which is your elemental hand shape and the “strong” finger on your hand — both of which reveal many personality traits on their own. Your strong finger is usually the straightest, thickest or most pronounced digit on your dominant hand relative to the other fingers. One of the world's rarest personality types in palm reading — the High Priestess archetype — has water hand shape (long fingers and a rectangular palm) and a strong Mercury (or “little”) finger. This pairing is very unique in palmistry for several reasons. The High Priestess archetype possesses a lot of inner strength and power, as well as some psychic tendencies, in many cases. Water hands often indicate strong emotions, intuition, and adaptability, whereas Mercurians — people whose little finger is the most dominant on their hand — are curious and intellectual, preferring mental pursuits. There are several famous people with High Priestess archetypes, including creative individuals — like Frederic Chopin, the famous composer, or singer and actress Jennifer Lopez — and even political leaders like Queen Elizabeth II and former US president Barack Obama. It is more common for women to have this archetype, but there are influential and intense men who share it, as well. So what does it mean if you're a High Priestess archetype? High Priestess archetypes often possess unbelievable amounts of inner strength and power. They believe in governing their own lives and directing their hearts where they think they should go. This archetype doesn’t rely on outside opinions in order to seek approval, but tends to focus on answering their own questions, and may even appear to keep their own counsel a little too closely sometimes. This can make them appear withdrawn and hermit-like at their worst, but certain and strong at their best. They’re great decision-makers because they trust their instinct in a given situation and are willing to make the hard choices if they think it’s what’s best for those involved. High Priestesses are often example-setters that others follow because of their unwavering dedication in pursuit of their own truth and their ability to take charge of a room. Thanks to the influence of their water hand, High Priestesses are unmatched at being able to recognize a situation and quickly make changes as necessary in order to get through it. Because of their watery nature, they “flow” from one thing to the next, adapting to what the environment calls for and setting a new path easily. When important decisions have to be made, a High Priestess is a good person to rely on — both for their quick thinking and for their ability to reassess any changes and “go with the flow,” in order to accomplish their new goals. People with this personality type often require a fair amount of “me time” for themselves because of their spiritual and intellectual pursuits. They appreciate and honor their own introspective natures, allowing themselves the time to assess what they need from a partner, so they don’t typically rush into a relationship — unless they’re ignoring their inner selves, in which case, the relationship probably won't last. A High Priestess may take a long time to choose their partner, but when they decide, it’s because they feel that the person they’re with is their best match. So while they’re independent and respect their partner’s choices and needs, they still love to enjoy quality time together. They’re often looking for someone who can help mitigate the outside world for them, since a High Priestess can sometimes become “stuck” in their own head. If you’re picked by a High Priestess, it means they really see something special in you. High Priestess types have strong Mercury fingers, which means they already tend toward being curious and intellectual. These tendencies, combined with their water hand, make High Priestess archetypes uniquely suited for emotional “knowing”. They are largely able to read people very well and intuit a lot of information and details both emotionally and spiritually. 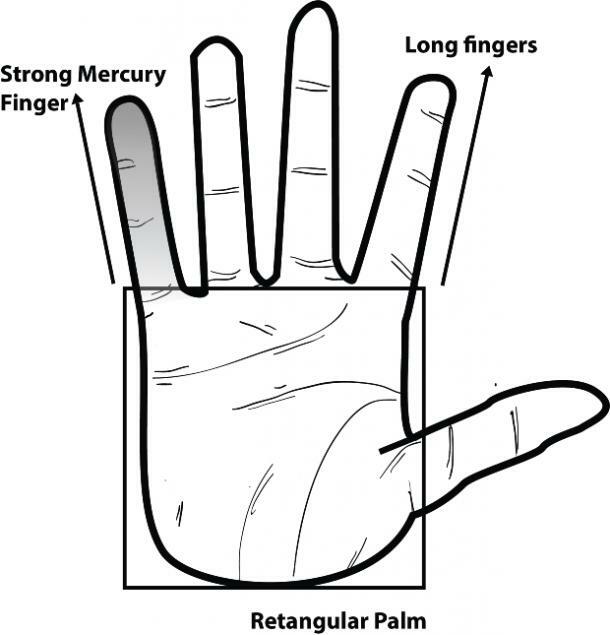 When your Mercury finger is dominant, think of it as a big “antenna” that means you want to collect as much information as possible on any given subject. High Priestesses often tend toward understanding on a different level than other people do, which may give them unique psychic capabilities since they’re always gathering information around them, whether they mean to or not. It’s not uncommon for a High Priestess archetype to get a feeling, a dream, or a strong urge to do something or reach out to someone. Ignoring this urge is denying your own intuitive or psychic instincts. You may miss an opportunity to speak with someone before they die, or not get a chance to help a friend even though you think they need it. High Priestesses must pay attention to their instincts on a problem because ignoring it could lead to regret later down the line. There are some amazing benefits to having the world's rarest personality type in palm reading, but it also comes with its own drawbacks, as well. People with the High Priestess archetype have incredible intuition. But, because of their nature, they may end up becoming imbalanced when they’re stressed. This could be that they become withdrawn when things are tough, or even that they ignore their intuitive cues and don’t spend enough time practicing their gifts. Either focusing too much or too little on your traits as a High Priestess could make someone with this archetype feel unfulfilled or incomplete. The High Priestess archetype has much to offer the world, and their ability to connect with others and intuit and adapt to situations and even emotional influence make this a special personality type with many unique character traits. If palmistry reveals that you’re a High Priestess, then be glad for your unique archetype and work hard at keeping your needs and wants in balance with your authentic self, in order to reap the rewards of your gifts.